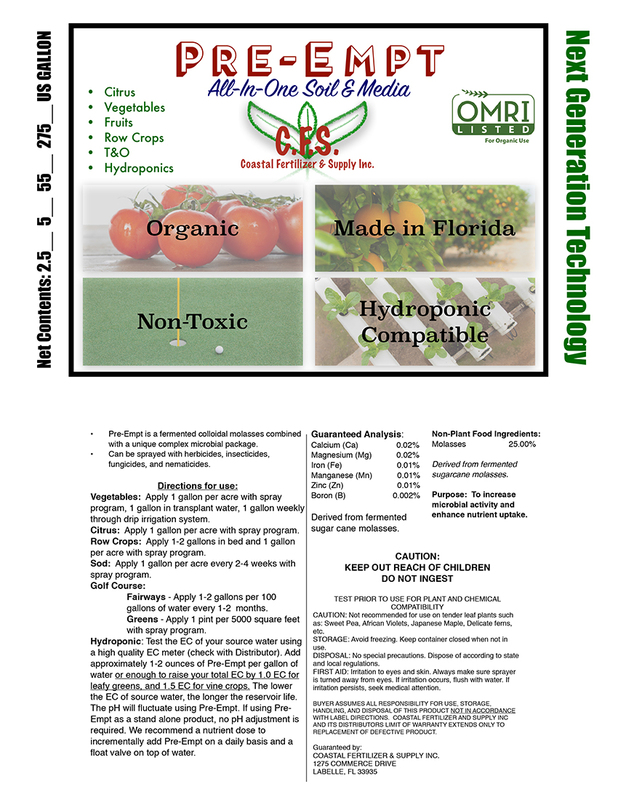 OMRI-listed Pre-Empt is a revolutionary product that can completely replace conventional hydroponic fertilizer programs. Pre-Empt was developed for recirculating nutrient film technique (NFT) crops including lettuce, leafy greens, basil and other herbs. Testing has proven Pre-Empt to be a suitable hydroponic fertilizer for nearly all crops without any additives. Pre-Empt goes through a five stage fermentation process that incorporates molasses with other natural plant extracts. This process packs Pre-Empt with essential macro- and micro-nutrients, amino acids like humic and fulvic acid, as well as an array of vitamins which build a full spectrum of nutrients. We suggest pairing Pre-Empt with Terra Bella, a root microbe inoculant, to naturally promote the uptake of nitrogen and other essential nutrients for plant growth. The combination of aerobic and anaerobic microbes in Terra Bella works throughout the root zone to increase crop yield and resistance to disease and pests. The “Organic Hydroponic Leafy Greens” guide by Tyler Baras gives some great info on growing leafy greens with Pre-Empt. It’s a downloadable PDF that you can get for free just by filling out a form. Click here! TerraBella infuses the root zone with beneficial microbes—increasing yields and improving plant health.